Why You Might Not: Unfortunately, customer reviews suggest Lean Fat Burner for Her is not a potent as Fit Affinity appear to believe it is and it appears to have somewhat of a hit-and-miss success rate. 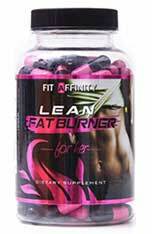 As the name suggests, Lean Fat Burner for Her is a diet pill that’s designed to function as a female fat burner. It’s produced in FDA-approved faculties in the US by Fit Affinity. The company also has several other supplements to its name, some of which are intended to be exclusively used by women and others that are only intended for men. Fit Affinity products have the virtue of being a little cheaper than most competing products, but they also lack versatility. So, whereas women buying one of the top-rated female fat burners will only need to pay for one product each month, the average woman who opts to go with Fit Affinity is likely to need to buy at least two because Lean Fat Burner for Her is not designed to provide hunger control. Unfortunately, customer reviews suggest Lean Fat Burner for Her is not a potent as Fit Affinity appear to believe it is and it appears to have somewhat of a hit-and-miss success rate. Let’s take a look at the formulation and try to figure out why. Pantothenic Acid (20mg): A B vitamin that assists energy metabolism and supports correct nervous system function. Biotin (100mcg): Another B vitamin that helps the body extract energy from food. Biotin is sometimes added to beauty products because it’s necessary for healthy-looking hair, and is good for the nails and skin. Cayenne Powder (250mg): A spice rack favourite that proven to be hot stuff in the weight loss department as well. Science shows this red pepper extract is a fat burner that works. Green Tea Leaf Powder Extract (250mg): There is plenty of clinical evidence that proves green tea is a good fat burner and one study shows it can go on working for up to 24 hours. Caffeine (130mg): A fat burning stimulant that boasts proven value as a weight loss provider and also enhances mental focus and concentration. Acetyl L-Carnitine HCI (110mg): A compound that’s believed to be capable of supporting accelerated fat burning without loss of muscle mass. 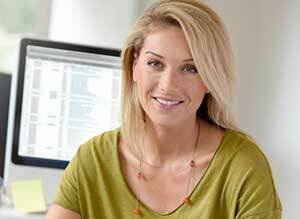 Choline Bitartrate (100mg): An ingredient that provides choline. A clinical trial involving a group of female judo and taekwondo athletes suggests supplementing with choline may provide rapid weight loss. Unfortunately, the women who took part in the study received 2g of choline each day. The amount provided here is unlikely to do much at all. Guggul Powder Extract (50mg): A powdered tree sap. When guggul resin is combined with L-tyrosine, phosphate, and hydroxycitric acid it appears to be capable of supporting the fat burning process. However, none of these are included in the formulation so guggul may as well have been omitted as well. Advantra-Z (50mg): A patented citrus aurantium extract. The synephrine (stimulant) provided by citrus aurantium has natural fat burning capabilities and, like any other stimulant, can be good for providing extra energy. Cocoa Seed Powder Extract (50mg): Cocoa contains a mild stimulant called theobromine. Although it lacks the potency of caffeine, theobromine offers additional value because it’s known to have a positive effect on the mood. Alpha Lipoic Acid (44mg): A vitamin-like compound. The dose provided here is far too low, but doses of 1800mg per day have been shown to have a waist-reducing effect. Usage Guidelines – Fit Affinity state exercise is not needed but will provide improved progress. Women who are planning on exercising are told to take two capsules with breakfast. Women who are not planning on exercising are told to take two capsules with food, but no specific time is mentioned. Only one dose is required each day and, after eight weeks of use, a seven-day break is required. Customer reviews suggest the formulation can be hard on the stomach. With this in mind, we suggest seeking a doctor’s approval prior to using this product. You can buy Lean Fat Burner for Her from the Fit Affinity website and international shipping options are available. 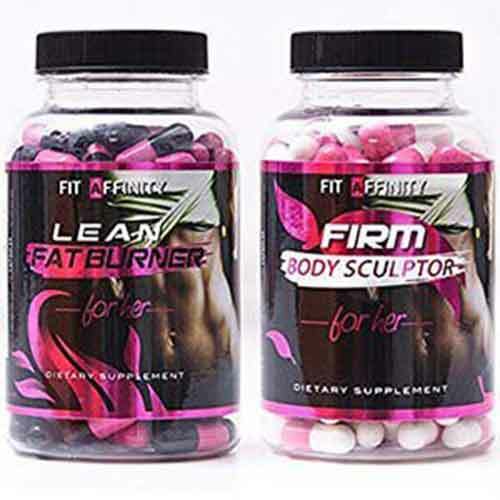 Each bottle provides a 45-day supply of pills and customers who wish to do so can receive a 60% discount by purchasing Lean Fat Burner for Her as part of a weight loss bundle that pairs the product with an appetite suppressant for women (Firm Body Sculptor for Her) and supplement designed to aid digestion and ease bloating (Tight Tummy for Her). Fit Affinity also sells via Amazon.com, but delivery is restricted to addresses located in the US. Fit Affinity doesn’t offer a money back guarantee. Although some of the ingredients used in Lean Fat Burner for Her have unquestionable value, some of them have more disputable abilities, while others, though potentially good, are hindered by low inclusion rates. The formulation will no doubt offer some value to women who are already losing weight with diet and exercise, but ladies who need help to control their hunger will need to spend again to get this vital support. This only serves to push up the cost of using this product and, bearing in mind the reports of side effects and the lack of a guarantee, Lean Fat Burner for Her does not compare well with some of the other options available to women who need to lose weight. 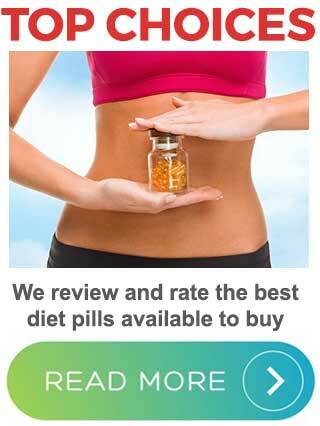 We review all diet products and rate them accordingly. We use certain criteria to order the best products.